Okay, so it wasn't so far away, but it does seem a long time since I started working on my bowsprit project. It was meant to be my big winter project, but here it is late spring and I'm just finishing up. What with working like a dog on a new iPhone project, shoveling snow, and snatching the odd spare moment to work on the bowsprit, I've not had time to blog, but on this beautiful spring day, I decided to take a day off and (start) to catch up. But where to begin? Where to begin...? The story actually starts nearly five years ago, in October of 2010 in a galaxy called Georgia. Long time readers will recall that I discovered some rot in the end of my bowsprit and had to perform emergency surgery which shortened the sprit by over a foot. You can revisit those happy days by reading the blogpost called Bowsprit, but suffice to say I've been meaning to replace it ever since. The original sprit was built from laminated Douglas Fir. This time, I had my heart set on building the sprit from a single timber. The reason is simple: I meant to varnish it and thought a solid spar would look better than a laminated one. Also, I'd already had the pleasure of gluing up a spar -- two of them, in fact -- for the Blue Moon's 'new' boomkin. If you missed my boomkin saga, it starts with this post: A Bigger Bumpkin. Carving a sprit from a 4" X 4" timber would be a new challenge, I thought. And, oh, I was right. The original plans call for a 'spruce' bowsprit, so back in January, when my Christmas projects were done, and I finally had time to start on my new project, I started hunting for a clear (meaning knot-free) spruce timber. Now, spruce is not a rare and exotic wood. It grows throughout the northern part of North America, from Alaska to Nova Scotia, and is one of the most used woods for construction 2x material. If laminating the sprit was acceptable, I could probably have dug through piles and piles of 2x6s, until I found two or three clear pieces I could glue together. But kiln-dried construction lumber just wasn't what I was looking for. No, I wanted a clear, air-dried, spruce timber. Something that, 50 years ago, I might have found fairly easily. But today? After calling a dozen small mills, and every marine timber business in the north east, I started to wonder if such an artifact even existed. But finally I thought I'd found one. A woman at Condon's Lumber thought there might be a 4x4 piece of Sitka Spruce in her warehouse. She quoted me a price which made my eyes water, but what did I expect for the last such timber on earth? "I'll take it!" I said, but alas, she was mistaken. It had been sold long, long ago. My spirits plummeted. Did I really live in a world where such a small piece of wood (relatively speaking) was simply unavailable? It seemed so, but I kept googling and dialing, hoping against hope to find a source. Finally, I found an old article in the New York Times (Loggers look at a Tree and See a Boat) about a company in Connecticut called New England Naval Timbers. The article was about a Cornwall logger named Charles (Duke) Besozzi, who was "supplying select timbers for the grand schooner restorations and one-of-a-kind wooden yachts that are being brought to life in boat yards up and down the New England coast." That sounded promising, though a bit grand for my little bowsprit project. I was actually too intimidated by the words 'Naval Timbers' to call Duke right up, but after running down every other lead, his name was the only one left on my list. I found his phone number, and gave him a call. Turned out, he didn't have any clear spruce, or any other softwood that would serve the purpose. After kicking the problem around for awhile on the phone, he finally asked, "How about white oak? Historically, white oak was often used for spars." My first thought was white oak would be too heavy. 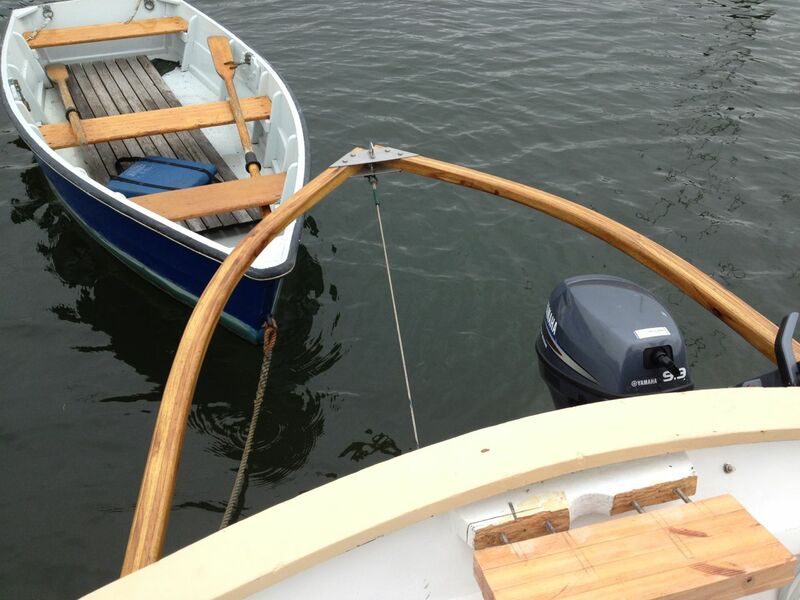 But after chewing it over a bit, I realized 1) it would only make a difference of 10 pounds or so, and I thought nothing of hanging a 35 lb anchor off my bow, and 2) the Blue Moon could actually use a bit more weight in the bow to balance the weight in the stern. "I'm sure I can find a couple nice, clear pieces for you," Duke said, temptingly. Well, that might have been true in the summer, or even a normal winter. 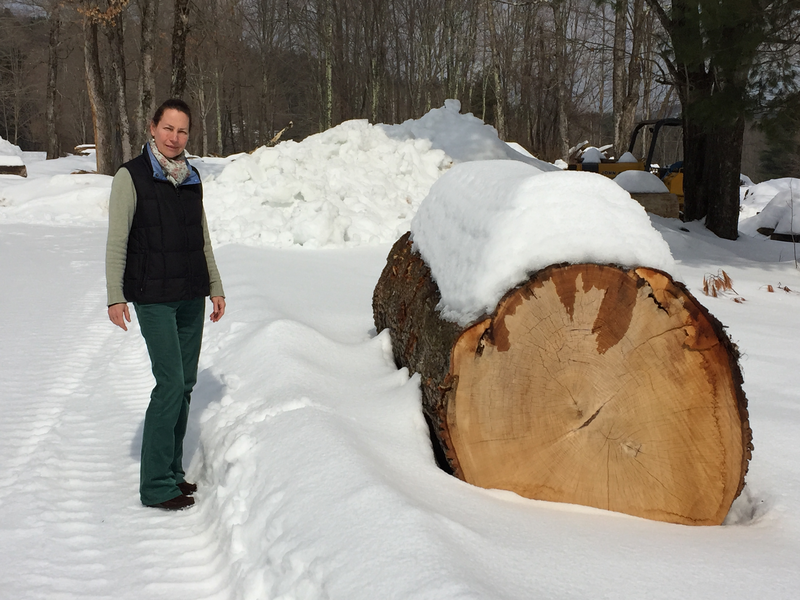 But in February of 2015, all that beautiful white oak was buried under enormous drifts of snow. 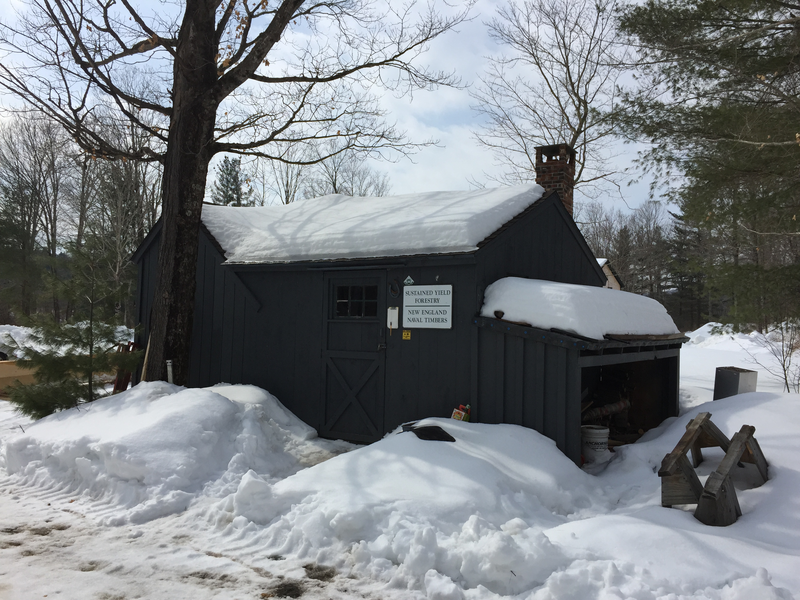 It wasn't until the first week in March, when the tide of snow began to ebb, that Duke and his crew were able to dig out and mill up the two pieces of white oak that I'd ordered. 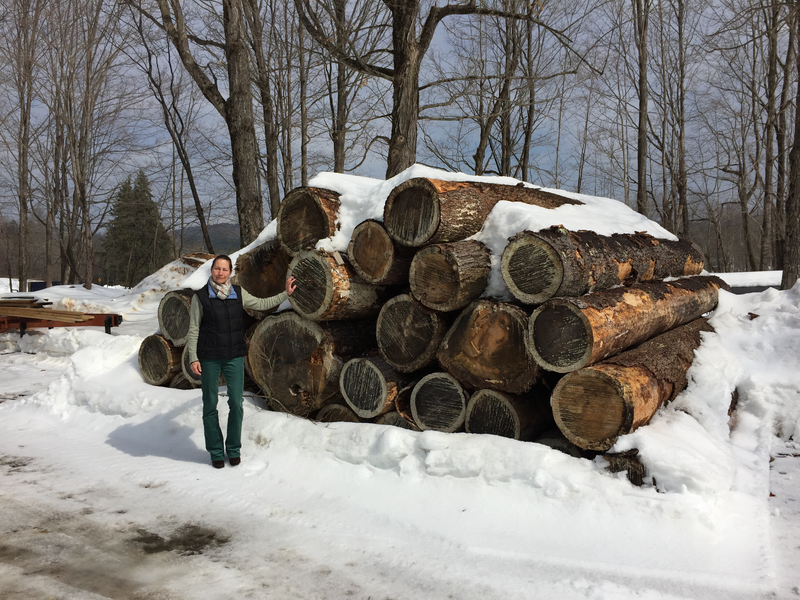 Helena and I jumped in our station wagon and drove up to one of the prettiest parts of New England to collect our bits of wood. 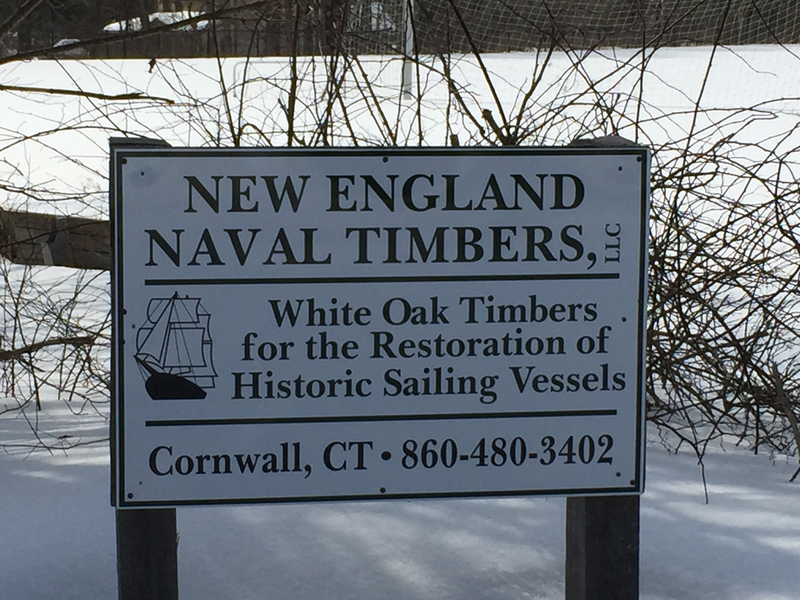 The offices of New England Naval Timbers might have been modest, tucked away, as they were, in the snow-bound woods, but their product was decidedly not. 'Prodigious' would be a better word for it. But those dreams were for later. There was business at hand. 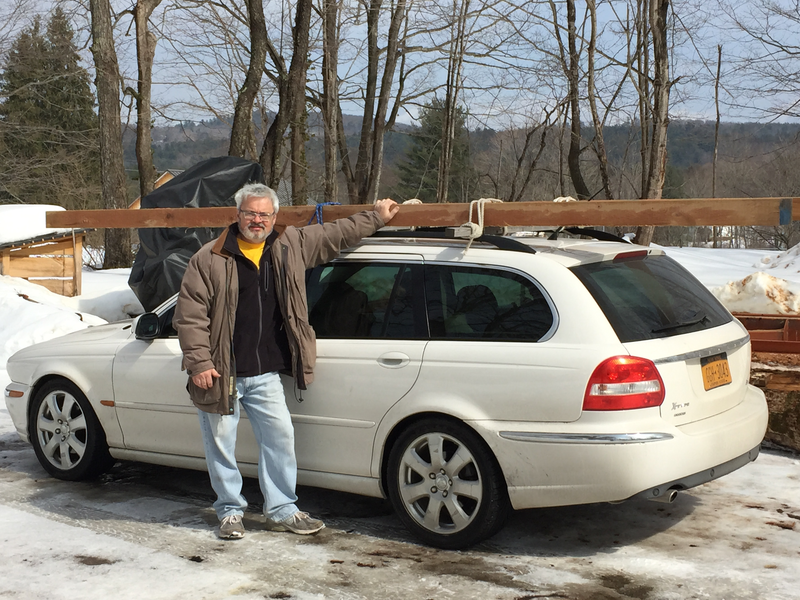 Money was exchanged for lumber, and then it was time to hoist two pieces of wood onto the roof of my car. Two rather heavy pieces of oak: one 4"x4", the other 4"x6", both about 16-foot long. "Ooff!" I grunted, trying to pick up my end of the first piece. Jeff, the burly sawyer at the other end of the stick lifted up his end with one hand. "It's not that heavy," he assured me. Helena scrambled to help me lift my end and together the three of us hoisted first one, then the other even heavier piece onto the car. Jeff helped me tie the wood securely to my rack -- it wouldn't do to have weighty javelins flying through the windshields of cars on the Hutch -- and then we reluctantly headed back to New York. The quest for wood was over, but as I looked at the timber's profile through my sunroof, I wondered how I'd manage to shape that massive balk into a slender, tapering spar?